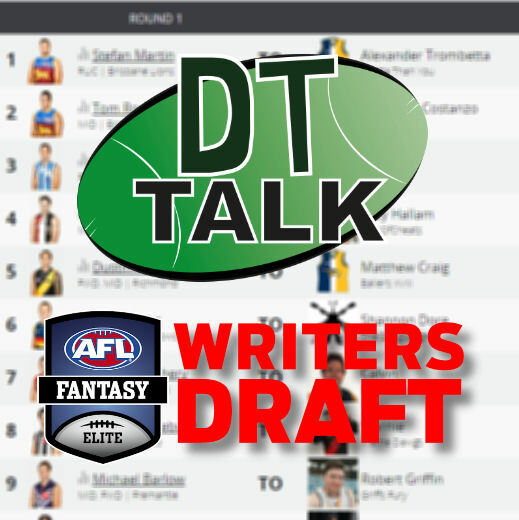 A whopping 16 DT Talk writers jumped in an AFL Fantasy Elite draft on Friday night and here are the results of the 240 picks. On Friday 4 March, sixteen of our writers jumped on their computers/laptops/tablets/phones to take part in our annual draft. We decided on the 3-4-1-3-(4) structure due to having 16 teams. 240 players were selected (some not by choice, hey Roy and Crutt) in a pretty intense night of picks. The first round played out way differently than we anticipated. Stefan Martin at #1, leaving Rocky to slip to a happy Jeppa. Roy kept his love for Goldy going taking him at 3 while St Kilda supporting Rummerz was happy to have his boy Jack Steven at 4. Surprisingly another three rucks went in the first round with Shags grabbing Jacobs, Anthony Nic Nat and Tristan Blicavs. I was stoked with Pendles at 8 but the biggest surprise would have been Ablett sliding to 16. I don’t think that will happen in many any other drafts! Click through the draft as it happened in the table below and take in what our writers said about their teams, along with what their line ups look like. Discuss our draft in the comments and feel free to chat about your own… and if you are keen to set up your own AFL Fantasy Elite drafts, post your codes and details. DOWNLOAD: Official AFL Fantasy Elite Draft Kit 2016. Here’s some quick thoughts from our sixteen coaches and their teams. I normally walk out of an Elite draft hating my side, but I’m very happy with the squad I pulled together this year. I went with a standard Value-Based Drafting strategy and right away I knew that with only 4 starting MIDs and 16 teams, the Ruck line would be crucial. Ultimately, that led me towards Stef Martin over Tom Rockliff with the first pick overall and I think that call was justified given that 5 ruckmen were taken inside the first round alone. I managed to secure a couple of players I targeted (Sheridan and Duncan), while locking away Suckling (B/F) in the middle rounds was a clever flex pick that helped set up a deep and malleable squad. My strategy with any draft is to select the best player available in the first few rounds then fill the holes. After Tbetta surprisingly opted for Stefan at Pick 1, picking Rocky was automatic. It was a long wait till my Round 2 selection (Pick 31) but thankfully, premium forward Luke Dahlhaus was still available. Soon after, Jack Macrae was there for the taking and in my opinion, the young Bulldog will challenge the Top 8 Fantasy mids this season. I’m pretty happy at this point! With all the gun ruckmen gone early, I panicked and took Maric at 63. In hindsight, I should have gone with young gun Devon Smith who was still available and picked a low key ruck like Nicholls or McEvoy at around the 100 mark. Enright at 66 was my first defender selection and now it was time to get creative. Tom Bell and Isaac Smith were my next two picks and both can go big when they’re on. My favourite pick of the night was new Eagle Jack Redden at 130. Redden averaged 106 back in 2014 and when he gets going in the second half of the season, look out! If I had my time again I’d be far more organised but looking at the other coaches, I think I faired pretty dam well. I came into this draft will no real strategy, other than trying something a bit new by drinking more Boags than I usually would and just using the ‘vibe’ of the draft to influence my selections. This laid back strategy was working a treat until round nine, pick 131 when an ill timed top up, combined with the slowest NBN in history ignored my last second Mitch Wallis and I was introduced to Ethan Whos? Oh, I mean Hughes. Lesson: Spend some time completing your pre draft order to avoid this. Even with this disaster, my team is very good across three lines with Goldy leading the way, supported by a midfield that will all average triple figures. Next draft I will find a happy medium, drink before, but not during #winning. I started from the 4 slot. For my first two picks I selected Jack Steven and Dayne Beams. Steven is a bit of a YOLO pick as I’m banking on him keeping or improving on last year’s average and Beama is a gun when fully fit. Rucks tended to disappear quickly so I jumped on big Gawny next. Watching the GWS/Syd game, old mate Stevie J caught my eye, so I chose him, and then his incarnate, Jack Billings, with my next two picks. I felt I had better grab some defenders, so next up was North’s Jamie Macmillan, who can pump out some decent scores when healthy, and then a safe bet in Andrew Mackie. I completed my mids by selecting Ryan Griffen and David Zaharakis who I both believe can average above 90 this year. My last forward was Bird is the word and my last defender was Jason Johannisen who I’m hoping gets some midfield minutes as a defender. To finish off, my bench consists of Jack Crisp, Eddie Betts, Shane Biggs and Scott Selwood. An eclectic bunch. I had a plan heading into the draft, which was thrown out the window when Goldstein and Martin were gone by pick 3. I was still happy to get Dusty Martin at pick 5. Next I made sure I had a solid defence by taking 3 quality defenders with my next 3 picks. No headaches needed there. You can’t plan for an internet meltdown, thus Chris Masten in the 5th round. Moving on… I’m happy with Sandi in the ruck. There’s a lot of depth in midfield, so I was patient. This will make or break my team. I took Caddy, Wallis, Hunter and Viney as my 8th, 9th ,10th and 11th picks respectively. All of them are capable of averaging close to 100, but I’ll need at least three to make that leap if I’m to have a successful season. Westhoff and Stokes round out a solid forward line. With my final pick I gambled on a position change, selecting Dal Santo in the hope he plays off half back. It could have been better, but there’s still plenty of potential! This was my first EVER draft league so I felt somewhat intimidated by the experienced players I was up against. Armed with my hastily drawn up spreadsheet and a copy of AFL Fantasy Elite Draft kit by the traders I got going. I was hoping to grab one of the better rucks with my first pick 6 (unless Rocky was there, as if), unfortunately couldn’t get S.Martin or Goldi so I set myself for Jacobs hoping he would have a year like 2014. I chased after all mids for next three trades grabbing Sidebottom, Armitage, Goddard, quickly grabbed Birchall as there was a defender rush and then grabbed Cotchin. Filled the remainder of my defense with Gibson, Baguley, and have the risky strategy of forward smokeys in Touk Miller, Vanderberg and Shaun Edwards. I felt that I JUST missed out on so many players, but that’s the nature of the beast. At Team Calvinator we always say “defenders are pretender” and this year, this is so true. They are such an ‘unknown’ so therefore they we’re the last thing on my mind when drafting. I targeted midfield guns and was pumped with my main three in Hannebery, Neale and Sam Mitchell. Harley Bennell and LeCras are both set for another huge year and securing the new No. 1 ruckman at Port in Lobbe, was a super grab late. Clearly the best team drafted on the night and set for a huge year. I couldn’t believe my luck when Pendles slid to 8. I was surprised with Rummerz taking Steven, Shags grabbing Jacobs… and even Calvin going with Hanners (no L) before the super-consistent Collingwood Captain. I thought someone would have taken Ablett ahead of him, although – now that this has happening, I now apparently have Pendles ahead of the Little Master. I grabbed Swanny with my second round pick ready to make him my F1 from round six. Taylor Duryea was my first defender picked, my fifth selection and the 72nd overall. He was the 11th defender taken, so happy with him in that range although, judging by how our draft unfolded, I could have held on him. NAB hype pick of Stringer was out of the norm for me, but happy… especially with grabbing Pearce Hanley as my last MID. He is half a chance to pick up DPP with the returning midfielders at the Lions. I’m going to have to play the waiver wire (or get some big trades happening) to get the solid midfielders that I need if those blokes gain DPP. One other pick I was happy with was Zac Smith as my last onfield selection to be my ruckman. He should be solid enough for my R1 if he is #1 at the Cats. Youth and Versatility; that was my draft strategy. Being in the middle of the pack I had to pick the best available with each selection, so I focused on getting solid scorers in the forward and back lines as quickly as possible. With Barlow and McVeigh leading these lines, I could afford to go speculative on guys with huge breakout potential in De Goey and Sutcliffe. These lines don’t have a huge the scoring gap between speculative guys and standard guys, so I won’t really lose out if they are mediocre. I loaded up in the midfield with two endurance outside runners who will keep going long after others fail; Gaff and Shiel. Paired with Hartlett and Ziebel, my midfield should be consistently strong. My backline looks a tad weak, but with Koby Stevens on my bench, I’m hoping he gets DPP by round six to really strengthen the squad. I’ll be honest, I made a joke on twitter earlier about my draft strategy being ‘panic when it’s my turn and pick someone!’ but I didn’t realise how true that would become! I was still in traffic during the first round and didn’t realise my phone was lagging during the picks, before I knew it ‘Your Pick’ and 25 secs were flashing on the screen and I was freaking out! So yeah, I grabbed Nic Nat since a couple of rucks had already gone. Do I regret this? Perhaps… Did it get any better from there onward? I wish! Eventually I got home and can say, drafting on the computer is definitely the way to go! I didn’t go into the draft rating any defenders too highly, I think they’re all pretty dodgy this year. That being said I focused on MID’s when I probably should have focussed on FWD’s a bit more first. Was able to grab Lonergan, Libba and Wines who I think will all have great seasons this year. Hodgey is generally decent so pretty happy with that. The rest is a bit of a mix bag who I’m hoping will over perform! I’ll definitely be scouring the waiver wire throughout the year! Also made sure to handcuff Nic Nat with Lycett hoping that if Nic Nat misses a game, Lycett should cover well. … this is going to be a long season. I was surprised at the first decision I had to make at pick 11. Gary Ablett Jnr was still on the board! However, I decided against and took the best forward still on the board, Leigh Montagna. Part of my strategy is to get the best forward, mid and defender I can early. Whilst I knew that Ablett would be gone, there was no doubt Montagna would be gone too at my next pick. Second I grabbed Priddis then got a defender in Kolodashnij. This gave me a solid player at each position. From there I set about another round with each position. As rucks flew off the board early, I left them til late. I ended up with Nichols, not entirely happy with him, but he will do the job, when I decided to leave them til late, I was hoping that Tippett would be left alone, but he went earlier than I thought. I picked David Mundy as he is usually a solid scorer, I took Brodie Smith as he may play more midfield and is eligible as a defender. When it comes to my bench I like to pick dual position players so that I can get the maximum coverage, hence I took Kerridge, Mitch Brown and Conca. Didn’t have an exact strategy going in to the draft, just knew that from pick 12, I would be getting the best available MID as none of the best rucks would be available. I started drafting on my phone which was smooth, but gave you limited info on one screen. If only I knew Ablett was available at pick 12! Probably went too late on rucks but did get Tippett and Sinclair which are both R/F and a nice handcuffing as if one doesn’t play then the other should boost their points. While everyone else was scrapping for rucks, I was pretty chuffed to get Heath Shaw with pick 21 and Zach Merrett with pick 44. Feel my best bargains of the draft were Jack Newnes (Pick 172) and Cam Guthrie (my last pick, 236). Overall pretty happy with my draft, but feel I’m a little thin in the forwards. With such a small squad size, yet large league, I wanted to get some safe points early – Fyfe at pick 13 offers that, and Titch at pick 20 offers a huge potential – love that it also upset my buddy Matt Craig! Rucks went hot early, so I needed to jump on. Happy with Grundy at 45, considering the ruck shortage. Next up was looking at some forwards. Wingard at 52 is solid, and I reckon Motlop at 77 is a steal! Deliberately avoiding defenders early, I think there are some great picks late in the draft that offer real value – but Matt Rosa stares at me long enough, and I take him at 84. Luke Shuey is a safe pick at 116, but it’s the pick before that concerns me – Missy Higgins. Hoping he can build on his first season at the roos. I DID NOT MEAN TO TAKE MATTHEW JAENSCH. I just couldn’t make up my mind. Aish or Pittard. So I autodrafted Jaensch. Yeah, I’ve got the sh*ts at this stage. I decided to focus on my midfield first and foremost. With the plethora of good cheap defenders I leaved that until last. I ended up losing wifi mid way through and consequently auto picked Roughhead! (Cheers Bali….) my mids are solid with Treloar, Danger, Shiels and Robbie Gray and my sole ruck man is Mumford! In the forward line I went for DPP in Hutchings, A Hall and Walters (Banking on him having an awesome year!). My Defence of Gilbert, Sheppard and R Henderson solidify my DPP capabilities and I think will consistently serve me well. I also made sure I have bench cover on every line! Awesome fun! Let the games begin. With my first picks being 15 and 18 I decided I needed a strategy where I could pair my picks, particularly as I would then have a big gap before my next pick at 47. When Blicavs was available at 15 that locked everything in place. I took premium mids in JPK and Ellis next, then some Fwds in Zorko and Lynch (Adel) and maybe paid slightly over for Kieran Jack at 82 when I panicked a little under the pressure. At this stage I still had no defenders but the best defenders remaining were now on par with the best Forwards remaining so I’d actually gained on balance. Eventually with my bench I wanted some flexibility to move Blicavs into the midfield if needed, so I took some Ruc/Fwd potentials in Stanley and Leuenberger. After being drawn the last pick (of the first round) in such a competitive league, I came in with a simple strategy. Take the punt on high-risk high-reward players, who others may have passed on for a variety of reasons. To my amazement I was able to land the GOAT, Gazza himself, at pick 16. I followed this up by implementing my pre-draft strategy and running the gauntlet with Matthew Boyd and Buddy Franklin with my second and third picks overall. However after taking Luke Parker, I ran into the misfortune of my Internet cutting out. As a result my 5th and 6th selections were auto-picked from a very poor pre-draft list (Gibbs & Yeo), paying the price for lazy planning and preparation. After 15 picks in total, I am relatively happy with my draft and cautiously optimistic about the season ahead. Who drafted the best team? How did Ablett slip down to pick 16!!! Anyone got an Elite league I can join? Amazingly (no offense) I reckon Calvin came out on top. Great all around, only place i would be worried about is D3 with Harwood and tanner Smith as back up. I voted for Lampshade purely due to the fact Gazza slipped to number 16. Every other team par Tbetta and Jeppa will rue that imo. Not me with Pendles. I have him ahead of Gaz in my draft rankings. AFL Fantasy numbers, dude. Check your stats. I’ll take Pendles on durability and his consistency. But each to their own. You don’t like me do you? I like Pendles as a pick btw as I believe he will be the 3rd highest averaging mid behind Rocky and Gary. While you may be justified in your pick the other 13 guys I believe may rue their decision. Sorry – thought you must have been pulling out SC numbers (with years mixed up). A big 170 can skew an average if you’re only pulling three games of data and calling that an average. Ablett is a gun, but he is turning 32 this year. Nothing to do with liking you or not, just justifying my selection. It’ll be interesting to revisit who scores the most points at the end of the year – which is important for Elite, over average. Warnie, bit lucky to have Pendles slip to 16. Wowee. The slim pickings in ruck department made me think I needed to grab a decent ruck, but yes I rue not grabbing Gaz, especially since it looks like Gawn would have been possibly available for my second pick! Possibly a rookie error there for my first ever draft. Fair enough, never been a draft when I haven’t rued a selection. Your tactics were different to mine though, in that unless your picking up Goldy or Stef with one of the top 5 picks I leave them till way later on in the draft. Saying that, cant believe I got Armo as my third pick and Cotchin as 5th, so pretty happy with my Midfield. If you are in a largish league[16 or 20] there just aren’t enough rucks going around and getting one or two decent ones is a priority. With limited interchanges coaches may be inclined to play a back-up ruckman, but we’ll have to wait and see. It resonates through the comments by the contestants yet they have not actually able to say what they think. Our elite league drafted on Thursday night and the website did not perform. Pure and simple. An extremely unenjoyable experience. Not our internet connection. Not our devices. Not our computers. The elite draft website was just not up to standard. We had no problem at all with the website… two people had issues – with their own internet connections. I’ve done three drafts so far and haven’t had one issue… and last night’s was 240 picks (almost 2 hours). Make sure you send something through to support. I will do that Warnie. I will email tomorrow as I have time constraints at this moment. The aim is to make a video out of our mates one in a fortnight. I might even do a periscope of some stuff from another draft I am doing next Sunday. Sounds good Warnie +1 would listen. Was fun. My first ever Elite draft. I think grabbing Jacobs pick 6 was a rookie error, especially in hindsight I could have grabbed Gaz and then Gawn! Totally amazed how late gaz went. Rucks drop off really quickly so scared myself into the Jacobs pick, since my second pick wasnt til pick 27. Happy with midfield. Couldnt believe Armo still around for my third pick and Cotch for 5th. Def is meh but ok. My main strategy was late smokey picks in fwd line with Touk Miller, Vandenberg, Edwards and Bradshaw. Roy with E.Hughes looks like he had more Boags than he says. Hughes is a default selection for people not present. I suppose the one positive of Hughes os that he is likely to go big in round 23 when he finally plays after Ross drops everyone good from the team. Had pick 2 in a 10 person league last Thursday. Picked Rocky after Jack Steven went first and then was wondering if I had missed the bad news when I was able to grab Ablett at pick 19. Guess we haven’t seen him yet but well worth the risk. I think some coaches need to make sure they take themselves away from Classic. For example, starting with an injured player in Elite isn’t terrible (Ablett example). If Roughead was available when it came to a bench selection, I probably would have nearly done it. One of our guys ended up with Hughes too. Worth dropping him to the bottom for future drafts. Elite league for skilled players. I think a lot of readers are missing that the 3/4/1/4 format paired with 16 teams had a huge impact on where we took ruckmen. The 65th ranked midfielder is always going to score a lot more than the 17th best ruckman, and that structural quirk manifested in 5 rucks being taken in the first round and hence, Ablett slipped to 16. ABlett as 16? What is this sorcery. Elite League now 6pm Adelaide time tonight due to circumstances. Code is 3MTT4M3C, name is “the boys” Get in! Anyone got any spots left in a draft league?